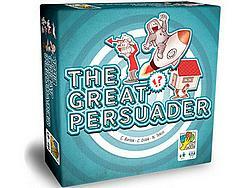 Will you be the Great Persuader? Can you convince someone to work as a scarecrow? Or that winning the lottery would be nothing but trouble? Get in the game and show off your skills as a Great Persuader! Challenge a new opponent each round with bizarre choices, preposterous jobs, and improbable claims while an "impartial" judge listens and decides the winner. When it's not your turn, bet on the best speaker. The greatest will get the applause of the crowd... and victory! 220 different subjects to play with!